...... Create workbook from selected worksheets. Create workbook from each selected worksheet. Copy worksheets to each workbook in a selected folder. Protect and unprotect group of worksheets in one click. 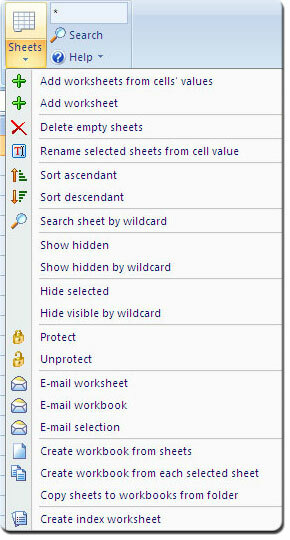 Show and hide selected worksheet and worksheets selected by wildcard. Search and activate required worksheet using wildcard. Advanced sort, delete, add, and rename worksheets. And in addition to all of these, you have full support of the newest Excel 2007 interface, sleek skinned dialogs, and fast access to local help and online support. Qweas is providing links to Worksheet Booster 1.0.787 as a courtesy, and makes no representations regarding Worksheet Booster or any other applications or any information related thereto. Any questions, complaints or claims regarding this application Worksheet Booster 1.0.787 must be directed to the appropriate software vendor. You may click the publisher link of Worksheet Booster on the top of this page to get more details about the vendor.